He was just nine years old at the time. 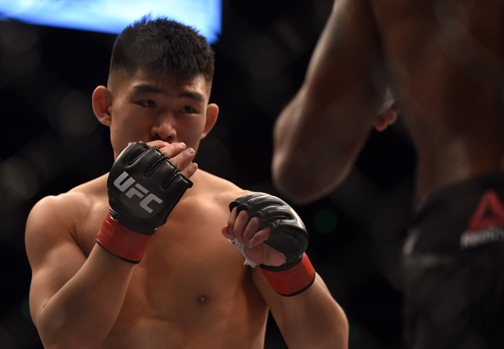 A decade later and Song’s thirst for action has led him into the ranks of the Ultimate Fighting Championship (UFC) and on to the biggest stage in mixed martial arts. Song is at the forefront of the Las Vegas-based promotion’s push into China, the country many consider the spiritual home of all martial arts, and the Tianjin-born fighter is among nine locals set to take part in the UFC’s first fight card to be held in the Chinese capital. Saturday night sees the UFC Fight Night 141 event at Beijing’s Cadillac Arena, headlined by a blockbuster bout between heavyweight contenders in Cameroonian-Frenchman Francis “The Predator” Ngannou (11-3) and American Curtis “Razor” Blaydes. But there’s little doubt where Chinese fans’ attention—and hopes—will rest. “It will be the biggest chance for us Chinese fighters and for the sport to grow in China,” said Song, who will face American Vince “Vandetta” Morales on Saturday night. Song’s rise to the UFC has captured China’s attention, as has the origin story he carries with him. After plying his trade in domestic and regional fight promotions—and racking up a fight record of 10 wins and three losses—Song received a surprise call last November, just weeks before the UFC was set to make its debut in mainland China. Called in to replace an injured fighter on the UFC Fight Night 122 card, Song needed just over four minutes to choke out India’s Bharat Khandare. He’s since backed up that performance with a second-round knockout of the Brazilian veteran Filipe Arantes in Singapore in June, and so comes to Beijing on a 2-0 run and with a 12-3 win-loss record overall. “There is still a lot of room for improvement in my skills,” said Song. “I am focused on winning step by step, fight by fight. I have been training with (UFC Hall of Famer) Urijah Faber and his Team Alpha Male in California and I am learning. The UFC currently has 11 Chinese fighters on its books, a mix of established stars such as the veteran welterweight Li “The Leech” Jingliang and rising stars such as Song and female strawweight Zhang Weili, with all three in action on Saturday. This week the organisation announced an investment of around $13 million in what it called the world’s biggest MMA academy in Shanghai, designed to help Chinese fighters make the transition from smaller fight promotions to the UFC octagon. Song has recently replaced “The Terminator” as his fight name with “The Monkey King”, in reference to the mythical Chinese hero Sun Wukong. He believes China’s rich history in martial arts has the country—and its fighters—well positioned as MMA continues to take hold.